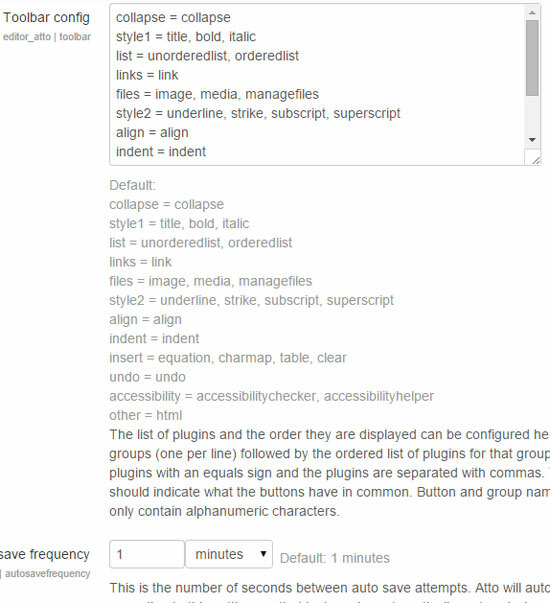 Starting with version 2.7 Moodle has a new stylish and pleasant visual editor Atto. Editor is included as a mandatory plugin in the system, which has its own settings. Users liked this visual editor, judging by the reviews, but there were some difficulties due to the fact that the basic functionality of the editor is limited. Indeed, the basic version of the editor functionality significantly cut down to the most basic editing functions, so in this article we will help you properly editor tweaking it to your needs. Block Settings » Administration » Plug-ins » Text Editors » HTML-editor Atto » Toolbar Options Atto. To add a new button or remove existing in a given block of buttons you enough to correct the text box settings named Configuration panel. All keys codes and their descriptions can be found in the table Plugins editor Atto of Atto settings page. Let’s say you want to add the button Font Color (fontcolor) to the buttons block Paragraph Styles, bold, italic. Next, go to the setup area Configuration panel. In our case, we need to add a comma new button fontcolor block style1 = title, bold, italic & mdash; should have style1 = title, bold, italic , fontcolor. Click Save Changes. In order for the changes to take effect immediately, preferably Clear all caches (Block Settings » Administration » Development » Clear all caches).